Congratulations to Cagatay Goncu, Kim Marriott and John Hurst who have received an Honourable Mention in the 2012 Touch of Genius awards, National Braille Press, for their work on GraVVITAS! You can see the full announcement at here. The text of the award is copied below. A $5,000 Honorable Mention was awarded to the team of Cagatay Concu, Kim Marriot, and John Hurst for their submission of “GraVVITAS: Graphics Viewer using Vibration, Interactive Touch, Audio and Speech.” GraVVITAS is a multi-modal presentation device which uses touch screen and haptic feedback technologies to provide access to graphics for blind people. A data glove equipped with vibrating motors provides haptic feedback when the finger is over a graphic element on the tablet computer. GraVVITAS also provides speech and 3D non-speech audio feedback to help the user with navigation. Dr. Cagatay Goncu, Prof. Kim Marriott, and Assoc. Prof. John Hurst began this project in 2008 as part of Goncu’s PhD studies, collaborating with domain experts from Vision Australia and conducting usability studies with blind participants. Gonchu, a research fellow at Monash University, focuses on universal accessibility, multi-modal human computer interaction, tactile graphics, and information visualization. Marriott leads the Monash Adaptive Visualisation Lab (MArVL) at Monash University and inspired this project after realizing how important accessible graphics were in education for a blind second year university student. Hurst is an adjunct associate professor at Monash University whose passion is helping students in their learning processes and researching into technology-supported learning. This entry was posted in Uncategorized on February 14, 2013 by Michael Wybrow. Our last was group meeting for 2012 was held at a house in Beddoe Avenue, adjoining the University campus. We decided to hold the meeting there since Tim and his family were living in the house at the time, but also because the research group was once located in one of these houses for a year during a time when the University was low on space! Kim talks about the memories of having afternoon BBQs, drinks and games of Pétanque, and his eyes gloss over as he thinks back to the glory days. Thus, it was only fitting have a BBQ for the meeting and dust off the Pétanque set for a few games in the sunshine. A few photos from the day follow. 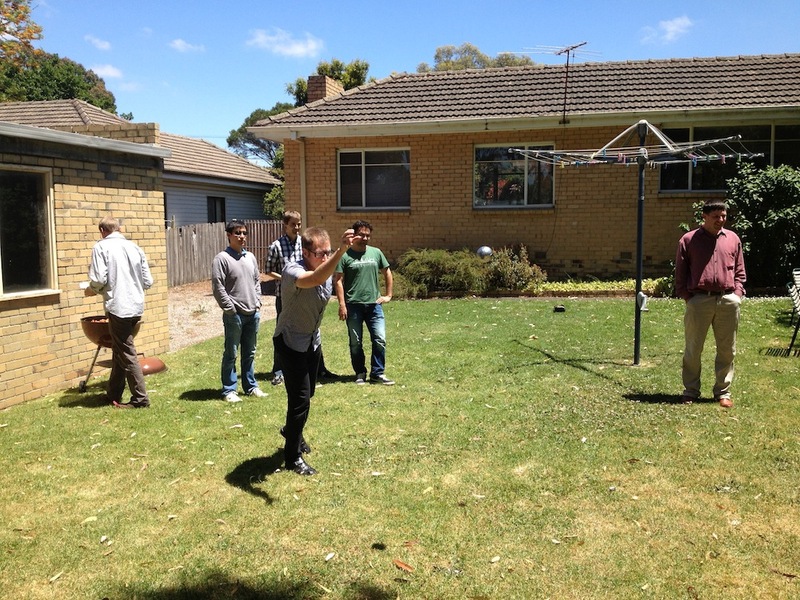 Lab members playing Pétanque at a house on Beddoe Avenue. A group tradition started many years ago when the research group was once based there! This entry was posted in Uncategorized on January 8, 2013 by Michael Wybrow. Welcome to the new MArVL website. Take a look around! This entry was posted in Uncategorized on December 18, 2012 by Michael Wybrow. Tim Dwyer has returned to Monash University and the MArVL group as a recipient of a prestigious Larkins Fellowship. Welcome back Tim! This entry was posted in Uncategorized on October 3, 2012 by Michael Wybrow. Congratulations to Peter Stuckey and Kim Marriott for winning the Best Paper Award at DocEng 2012 for their paper entitled “Optimal Guillotine Layout”. This entry was posted in Uncategorized on September 8, 2012 by Michael Wybrow. Congratulations to Cagatay Goncu and Kim Marriott for winning the Best Student Paper Award at Interact 2011 for their paper entitled “GraVVITAS: Generic Multi-touch Display of Accessible Graphics”. This entry was posted in Uncategorized on September 21, 2011 by Michael Wybrow. Michael Wybrow has won the CORE (COmputing Research and Education) 2009 Australasian Distinguished Doctoral Dissertation (the award for best Australasian Computer Science PhD thesis). Michael was supervised by Kim Marriott, Peter Stuckey (Melb Uni), Linda McIver, and Tim Dwyer. Congratulate Michael, Kim, Peter, Linda, and Tim on this outstanding achievement! This entry was posted in Uncategorized on January 22, 2009 by Michael Wybrow.